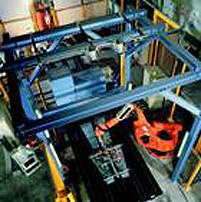 Robot & Vision Manufacturing Systems, Inc.
Associated with world class suppliers associations and universities. Continuous assembly is still a challenge for most industries. Robot & Vision Manufacturing, Inc. is building on the experience gained with automation sytems in the final assembly areas of automotive plants. After 2000, the field of applications has widened significantly, to include general industry. Another "First" was produced in the Food Industry. Vision Guided Robot loading cups into a GASTI yogurt fill and seal system. In the case shown the difficulty lays in the transparency, low contrast and reflectivity of cups, which makes them hard to see for machine vision. The stacks (rows) move a little within the carton after each gripping cycle. The Vision therefore determines their positions and depth before each cycle. Optical centering in front of a blank washer. Press loading and unloading is another application where the "Do not Stop the Line" philosophy comes to bear fully. Stop and centering stations are eliminated. Conveyors are half price and cycle time is improved. This in addition to the elimination of man power that comes with the automation in and of itself. A common thread through all these applications is the heavy-duty industrial use, yet cutting edge technology and machine building background. 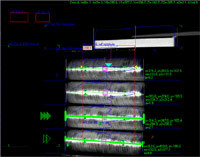 Vision guided robotic applications also share these same common threads. However, they also require robot programming, machine vision engineering, system controls engineering and mechanical engineering. This is where Robot & Vision, Inc. can help. Robot & Vision has the capability to design, build, install, and commission your next vision guided robotic application. Partnership with You! While we provide turnkey solutions in many cases, we can't be everywhere and do everything. Therefore, Robot & Vision can also complement your solutions by providing a module or perhaps an embedded vision robot, to a system in which you have the lead. We will protect your position - in writing, with a non-compete statement! Please call to explore how we could cooperate or how you could participate in some of our advanced projects. National Media is Taking Notice of Our Innovative Solutions. Literally thousands of labor intensive traditional stations have defied automation until recently. 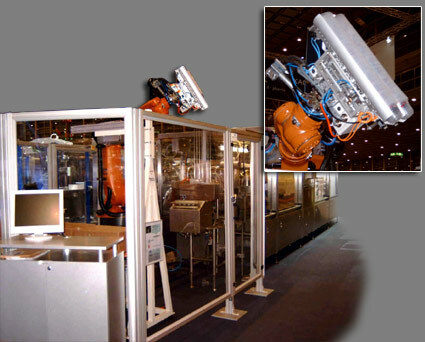 Our Real Time vision tracking solutions allow the automation of such stations, from paint lines to assembly lines. Video clip showing Robot & Vision's test-cell executing flexible, vision-based, automatic end-of-press unloading on the fly. (Without expensive mechanical centering devices and with greatly reduced conveyor complexity) The development of this application was derived from existing press loading & unloading applications in Europe. 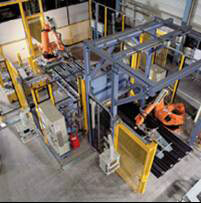 Video clip, showing Robot Loading hard to see and difficult to grip cups into a fill and seal system.